Blackdog Fullbore shoot has been cancelled this weekend (Sunday 9th April). We are trying to rearrange a Barry Budden booking for Sunday 30th April on Barry North. The results are available in the Wapinschaw section. 3/1/2016 - The Frostbite saw the strongest winds we have every experienced at a competition (50mph plus, with torrential rain). Andy managed the comp superbly. There was a great atmosphere with everyone present pitching-in. 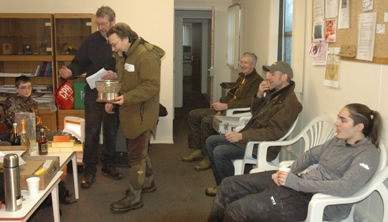 The Frostbite James Jeeley Jar was won and retained for 2016 by C. Bestwick. A full report will follow shortly. It has come to my attention that one or two members have not received their competency certificates. I did a batch about 3 weeks ago and posted them. If you have submitted a competency request to me but not received the certificate, please contact me via the club e-mail address and I will check and re-issue if necessary. We have alot of once-fired, cleaned brass for sale. Calibres available: .38, .308, .303 and .223 - Contact family@bestwicks.co.uk for details. A big THANK YOU to those members who turned up on Saturday to help with range maintenance. A lot was achieved including raking over both back stops, strimming, general cleaning and clubhouse painting. There is more painting to do so if any club members can help with this, please contact me via the usual means. For those new members not familiar with the Wapinschaw, I've provided below a brief history of what is arguably one of, if not the oldest, surviving shooting competition within the UK and my apologies to long standing members who have read this all before, many times over!! In recent years, the Wapinschaw Association and AFBGC have co-operated in running the Aberdeen Wapinschaw, with Neil James and Charles Bestwick representing the civilians on the association's committee. Tracing a lineage from 1496, Wapinschaw in their present form have been held at Aberdeen for more than 124 years. From a modern heyday in the 1970's, civilian involvement had progressively declined. 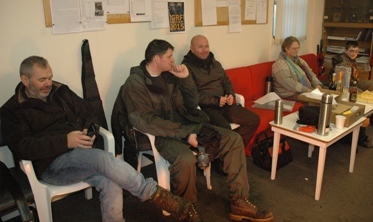 However, after the low point of the handgun ban, much hard work and commitment from AFBGC and Wapinschaw Association, in particular the drive and enthusiasm of the former Chairman and Wapinschaw President, Lt Col Cram, has seen the civilian and indeed the competition as a whole rejuvenated within the UK shooting calendar. As a measure of success, the civilian competition has been fully subscribed for the preceding three years. Competitors come from all over the UK and we have even had the occasional enquiry from abroad. The match takes place over a weekend, normally in May or June. The civilian ‘individual' competition takes place on the Sunday and traditionally consists of 200M and 300M matches. The 200M matches are subdivided into classes for open, sporting, vintage, veteran and classic military rifles shooting a composite course of fire of deliberate, snap and rapid fire stages and muzzle loading and black powder cartridge rifles each shoot a deliberate competition. The 300M match is subdivided into optical, iron sight and 'F' class formats. Essentially you should be able to find a class that either ideally or approximately suites your rifle type! On the Saturday the civilians also participate in the Falling Plates Team Matches in which teams of six run from the 300M point before engaging 10 plates at 200M in a knock-out team v. team format. This has proved very popular. For 2009, however, the format was somewhat different! Out with our control, a trial change of date to September inadvertently clashed with the Vintage Arms Scotland meet. Thus, to avoid harming attendance at a fellow and long established event, we confined Wapinschaw civilian entries to the North East region and so the vast majority of competitors were from the club. The club responded magnificently to support the event but obviously the usual number of competitive categories could not be justified. So, to create meaningful competition, it was decided to steam line the number of classes within the Sunday Aggregate. However, to compensate for the fewer classes, the aggregate was complemented by an ‘any rifle' pairs falling plate match and a Mad Minute competition. For the Saturday, the Falling Plate format was unaltered. Incidentally, the date change ultimately proved to have problems for military and cadet attendance as well! This report is a pdf file (780kb) and is edited from our club newsletter. As the club enters the Autumn, the sad news is that Ray Varrall has passed away. Ray was very much part of AFBGC life. As a long-serving committee member, Ray was heavily involved in club development and had specific responsibility for range safety. Ray also ran the Muzzle Loading Pistol Championship and was himself an excellent shot, being twice Muzzle Loading Pistol Champion and he again posted excellent scores as runner up in this year’s competition. Many members will also know Ray through his absolute commitment to training and he has helped many newcomers into the sport. His loss is widely and deeply felt and he will be remembered with warmth and respect by all at AFBGC. Ray was extremely supportive of an ‘active’ club and thus it is gratifying that following the array of competition reports from the July Drumbeat, there have been yet more excellent team and individual performances at club, regional and national level. Notably, the NESSCC season was the closest for many years and produced a season finale of incredible tension. A superb team performance at TSSC-Turin Hill ensured that AFBGC entered the final match at Drums with a one-point advantage over DRPC and what a match this turned out to be! Record PP1 scores were posted as both teams put together formidable performances but ultimately it was DRPC who triumphed by producing one of the finest combined efforts of any NESSCC meet. The margin of victory over AFBGC was one ‘team’ point for the five match series, with the score differential the narrowest ever at just 24 points for the season! Congratulations to everyone who shot for the NESSCC team; to Sandy Philip, Paul Holder and John Simpson for their individual placings in the various overall NESSCC and club-NESSCC leagues and, in particular, to Shirley Philip for her outstanding team captaincy. Finally, thanks are due to the NESSCC clubs for contributing to a great season and to DRPC for retaining their title. The Club Championship also produced a close run to the finish. 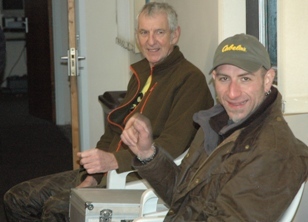 Going into the last event of the championship series, the Fullbore Rifle Competition, only one point separated John Crouch and myself in the overall points table. Ultimately it was John who produced a magnificent display of controlled shooting to add the Fullbore title to his retention of the 22 Championship and in so doing, becomes the 2007 Club Champion with a record 37 points. 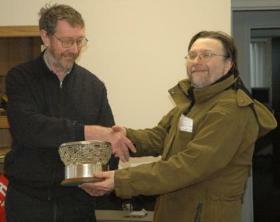 The full list of 2007 Championship winners is: John Crouch (22 Rifle, Fullbore Rifle & Overall Club Champion), Charles Bestwick (Pistol Calibre Rifle & Overall Championship Runner-Up), Buchann Chesney (Muzzle Loading Rifle); Don Robertson (Muzzle Loading Pistol). During the summer, Lara and I also returned to Bisley to compete at the Imperial Meeting and I hope to encourage members to add the Imperial to their list of AFBGC shooting commitments for 2008! The main part of this memorable competitive season has now drawn to a close but, in case you’re having withdrawal symptoms, the Frostbite Competition will take place on 30th December. I also hope to arrange ‘a gallery rifle and pistol action shoot’ in what remains of the year …but time will tell!